Luxuriously styled Anna Pavlova Suite. Jean Batten Suite the beautiful and fearless aviatrix. Mark Twain Suite - Named to celebrate his visit in 1895. Napier’s best located Boutique Hotel, on the waterfront with panoramic views of the Pacific Ocean – Masonic Hotel is an Art Deco jewel offering unique, characterful Napier accommodation options. 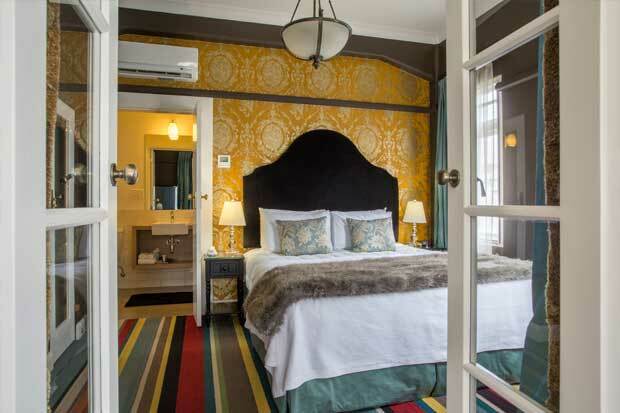 With a choice of stylish and individual Rooms, Studios, Suites, Apartments your stay at Art Deco Masonic Hotel is guaranteed to add glamour and fond memories to your Napier experience. Art Deco Masonic Hotel guests enjoy a choice of bar and dining options including; Emporium Eatery and Bar serving delicious breakfasts, contemporary lunch and dinner menu, locally roasted coffee and a great range of New Zealand and international beers, wines and spirits; Emporium - The Lounge a most intriguing and enchanting place that captures an era of elegance and grace where guests can enjoy fine wines and dining in more intimate surroundings; The Rose our friendly, authentic Irish pub. The Hotel has a variety of unique spaces for conferences, functions and celebrations and guests enjoy complimentary Wi-Fi. Craig Hay and Neil Barber, Owners and Proprietors.